On the 10th October, Central Kids Selwyn in Rotorua celebrated Fiji Independence Day as a whānau. We were very fortunate to have our very own Fijian whānau come in and talk to us about the importance of this day for them, and how they celebrate it. We got to see many Fijian taonga to share, traditional clothing, tapa cloths, mats, fans and lei. Tamariki learnt the names, how they were made and what they were used for. 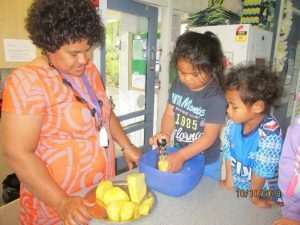 Immanuel’s Mum then showed us how to make yummy pineapple juice. Our tamariki really enjoyed this new experience. They listened to instructions very well, took turns with great patience, we were very impressed with their grating skills. The juice was loved so much, we will definitely be making it again. Thank you very much to our Fijian whānau for sharing your beautiful culture with us, we learnt lots. Thank you to all our whānau for joining us as we celebrated Fijian Independence Day, your contribution is always valued and vital to the learning and growth of our tamariki.